Feel the spirit of the Jurassic age - download Dinosaur Coloring Pages for Adults and unwind easily with the original dinosaur drawings inside one of the top-notch dinosaur coloring books for adults! Our new, inspirational and relaxing coloring book for adults is designed for all creative souls who adore the Jurassic era. Each of these coloring pages for adults represents a carefully designed dinosaur illustration that helps you relax and color your worries away! With over 200 nuances of colors in one of the best adult coloring books, you have the possibility to choose and color your dinosaurs coloring pages by simple clicks or manually part by part. MAKE EACH DAY YOUR PERSONAL MASTERPIECE! There are no rules when it comes to relaxing coloring pages like dinosaur coloring books for grown ups. It’s your own world of imagination. Unleash your inner child and start creating some of the most incredible dinosaur coloring sheets for adults in this detailed dinosaurs coloring book! 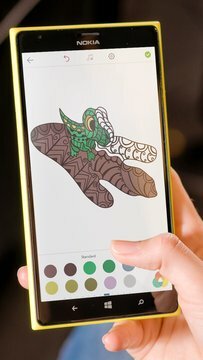 Brilliant Dinosaur Coloring Pages for Adults app is for sure an endless source of inspiration at your fingertips. Coloring sheets for grown ups also help people become more creative in their jobs, boost their analytical thinking and other skills necessary for work. No matter your artistic ability, just keep installing the relaxing adult coloring books and start creating your own masterpieces! SEE THE DINOSAURS IN ALL THEIR GLORY IN WONDERFUL DINOSAUR COLORING BOOKS! For centuries people have been trying to resolve the mystery of these fascinating creatures that once walked where we walk today - dinosaurs. Dinosaur Coloring Pages for Adults belong to anti-stress coloring books for grown ups that portray incredible visuals of the powerful giants. Through the original dinosaur coloring books, you are going to chill out while painting these magnificent creatures for hours. Try out these dinosaurs coloring pages and enjoy! There isn’t a better way to bring back some beautiful, old memories than turning to inspiring dinosaur coloring books such as Dinosaur Coloring Pages for Adults. What are you waiting for? 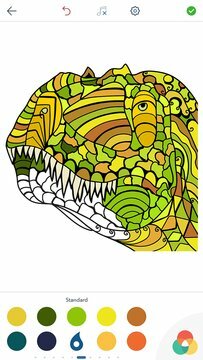 Install one of the finest coloring sheets for grown ups ever - dinosaur colouring pages - and wake up that creative artist within you! All the drawings and images in the Dinosaur Coloring Pages for Adults are copyright of Peaksel. For any questions and/or suggestions, please contact us.